Many airports have been aggressively adopting environmentally friendly practices in their airside operations and terminal building designs. But Fort Lauderdale-Hollywood International Airport (FLL) has become the first in the world to earn recognition for sustainable design and operations initiatives in its landside parking facilities, with Parksmart certification across multiple garage structures in its airport campus. Here's a sampling of environmentally progressive initiatives that helped FLL achieve certification. Running along the western edge of the top deck on Hibiscus Garage is an open observation area, where photographers and aeronautics buffs can watch the runways. This area can also double as event space for times when a new plane or a dignitary arrives in town. The airport has interlaced green spaces and fully grown trees throughout the parking campus and around the perimeter, providing cleaner air, stormwater absorption and reduced noise. 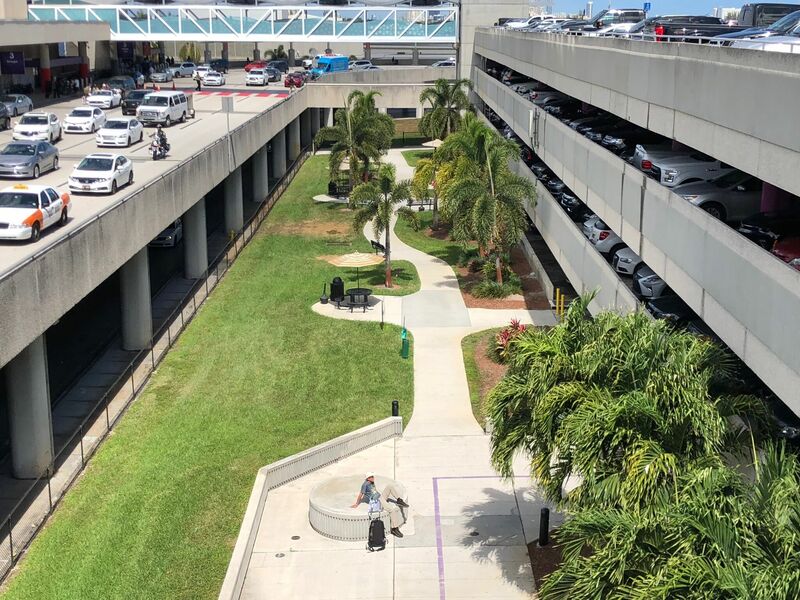 In addition, FLL installed a series of picnic tables and benches between Palm Garage and the terminals, allowing patrons and employees to enjoy the outdoors for meals, meetings or while waiting for travelers. FLL also accommodates the needs of canine travelers with a pet relief area, equipped with its own fire hydrant. This is becoming quite an appealing amenity with the recent increase in companion animals traveling on airplanes. A variety of artistic installations, including decorative facades, sculptures and wall hangings, are displayed throughout the garages. Hibiscus Garage, for example, is designed with four large brightly colored/illuminated tubes through the center of the structure, providing aesthetic value as well as functional ventilation. Cypress Garage’s marine-themed interior at the rental car center suggests a coral reef with designs on the floors, walls and ceilings. Single-space wayfinding systems direct drivers to levels, rows and available spaces, reducing circling and congestion. This significantly reduces fuel use, cuts emissions and relieves stress on harried travelers. In addition, the wayfinding system reads the license plates of parked vehicles and displays a vehicle finder interface on video kiosks and on the airport's app, enabling patrons to easily locate their vehicles. Electric vehicle charging stations allow drivers to charge up their vehicles while in town. Since airport customers average more than three days of parking per visit, FLL has located the chargers in the valet area, so that fully charged vehicles can be continuously swapped out for vehicles with depleted batteries. A complimentary tire inflation station has been installed near the exit area of the three garages. Properly inflated tires translate to higher fuel economy and increased safety, due to fewer tire failures. This saves patrons money and reduces overall emissions. A cell phone lot allows drivers to park while they are waiting for passengers to arrive. This reduces the vehicle distance traveled and idling, which in turn reduces emissions and fuel consumption. Additionally, the lot eases congestion by reducing traffic on the airport roadway and improves safety by reducing the number of cars standing in front of the terminals. FLL promotes its sustainability initiatives through educational signage and online information, believing it's important to encourage patrons, employees and visitors to opt for better environmental behavior choices. Integrating environmental amenities across the campus, FLL illustrates what can be accomplished, even in older structures, to maximize a site’s environmental value and efficiency.